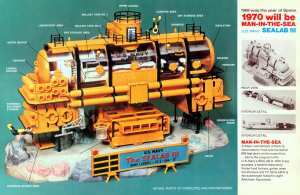 Sealab III Resin Model Kit – The Sealab III was an experimental underwater habitat developed by the U.S. Navy. Five diving teams of eight aquanauts were schedule to live at the Sealab III for a period of twelve days at a depth of 620 feet. Shortly after immersion the habitat began to leak and six divers were sent in for repairs. After a number of unsuccessful repair attempts, the Sealab program came to a halt. The Sealab III was retrieved but it was eventually scrapped. Masterpiece Models manufactures and sells the highest quality resin assembly kits on the market today. 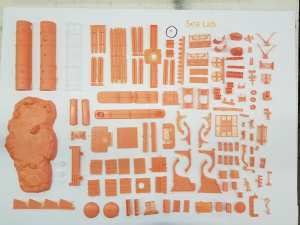 Featuring kits for a variety of interests including Dinosaurs, WWII, Vietnam, Scifi, and aircraft bases. We have acquired the rights to a large selection of the Custom Dioramics line that are now available through us as resin assembly kits. We manufacture our kits onsite at our Vancouver, Washington USA fabrication and casting shop. Interested in other Nostalgia Kits? Click on this link.